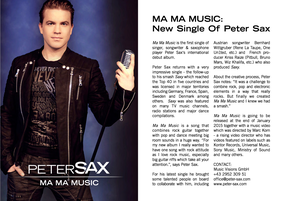 OUT NOW: Brandnew Single "Ma Ma Music"
Ma Ma Music is the first single of singer, songwriter & saxophone player Peter Sax‘s international debut album. Peter Sax returns with a very impressive single - the follow-up to his smash Saxy which reached the Top 40 in five countries and was licensed in major territories including Germany, France, Spain, Sweden and Denmark among others. Saxy was also featured on many TV music channels, radio stations and major dance compilations. Ma Ma Music is a song that combines rock guitar together with pop and dance meeting big room sounds in a huge way. 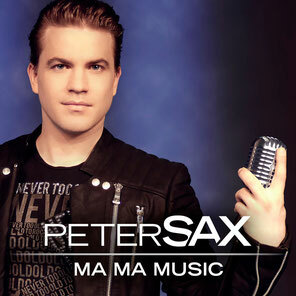 “For my new album I really wanted to have one song with rock attitude as I love rock music, especially big guitar riffs which take all your attention.”, says Peter Sax. For his latest single Sax brought some talented people on board to collaborate with him, including Austrian songwriter Bernhard Wittgruber (Rene La Taupe, One Un1ted, etc.) and French producer Kriss Raize (Pitbull, Bruno Mars, Wiz Khalifa, etc.) who also produced Saxy. Ma Ma Music is released together with a music video which was directed by Marc Korn - a rising video director who had video featured on labels such as Kontor Records, Universal Music, Sony Music, Ministry of Sound and others. Can you feel it? In all the different parts. And the world is, full of beating hearts. Can you feel it? We are one in our hearts. And the world is, unique and everyone's a part!